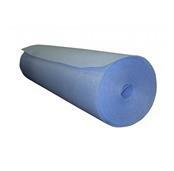 Gorilla Pads are pre-cut floor pads designed to protect and cushion the bottom of above ground pools. 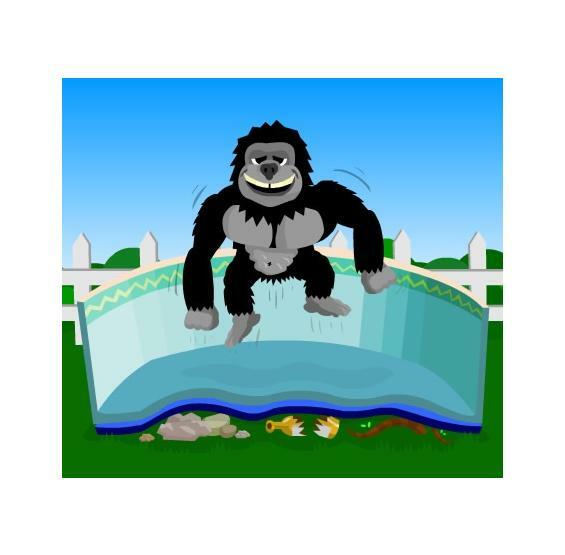 Unlike old pool foam padding, which can be easily be cut or pierced by grass, roots, or rocks under your above ground pool liner, Gorilla Bottom pool floor padding is impervious to almost any sharp object. FREE SHIPPING! 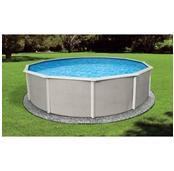 SUPER STRONG GORILLA PAD POOL FLOOR BOTTOM PROTECTS POOL LINERS FROM ROCKS, ROOTS, AND GLASS! 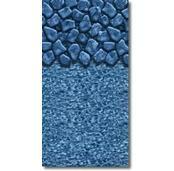 Gorilla Pad pool flooring makes old foam floor padding obsolete. 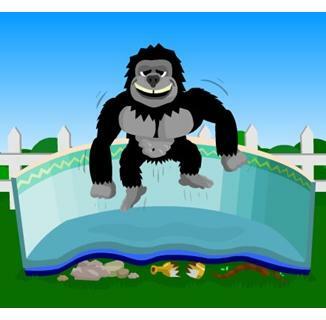 Unlike traditional pool foam, which can be easily cut by grass, roots or rocks under your pool liner, Gorilla Pads are impervious to almost any sharp object. Gorilla Padding is a nonwoven polyester geotextile that was developed to protect trash dump liners where any cut would be a catastrophe. Gorilla Floor Pads aren't limited to toughness. They also adds a layer of cushioning that will eliminate footprints from forming (if a sand base exists beneath the liner) and improves swimmer comfort. 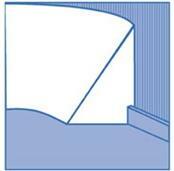 Gorilla Pads are cut to size and seamed for your above pool whether it's an oval, round, or rectangular pool. 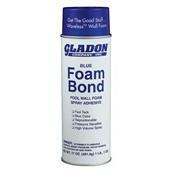 No more cutting and taping as with foam! 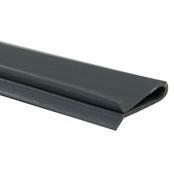 Virtually eliminate vinyl pool liner bottom leaks with Gorilla Pad. NOTE: Does not protect liner from nut grass. We advise that the area be properly treated prior to Gorilla Pad installation - all weeds, debris and grasses should be removed. In conjunction with the use of a pool cove, this makes for a much better foundation to install the Gorilla Pad, creating a better performing, longer lasting product. was easy to install, first we put a layer of fine sand , the this over sand. It has a little extra so we duct tape to sides.it made it easier to install the liner and move it into position. well made very tuff but not too heavy glad i bought it. got one for the 1st pool years ago!!!! getting ready for a new larger pool now and would not put up without it!!! well worth it!!! BUY this FIRST!!! Well worth the money! 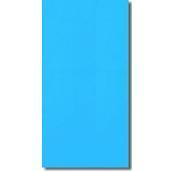 This is a great feel for your feet in the pool and avoids foot pronts in pool. We have haff no problems with our pool and had it for 6 plus years! Great product!